I’m sharing the last stop on The Capital‘s blog tour with Reader Dad. I’m not one for blog tours – this may well be both my first and last – but I couldn’t say no to this one. If you’ve been reading this blog for the last couple of years, you’ll be in no doubt as to which side of the Brexit divide I belong. Robert Menasse’s sprawling novel takes a sharply satirical view of the European Commission, exploring its many accumulated faults before bringing it back to the values which make me want to remain part of the EU’s flawed club. The Capital opens with a pig running through the streets of Brussels, catching the astonished eyes of many of its characters. Martin Susman, who will conceive the idea for the ill-fated Jubilee Project, spots it from his apartment window. Auschwitz survivor Dave de Vriend sees it just as he’s about to leave his apartment for the last time. Fenia Xenopoulou catches sight of it from the restaurant where she’s hoping to finangle a transfer to another department. When Martin returns from Auschwitz, shocked at its commercialisation, he hits on an idea to rejuvenate the ideals of the Commission via the jubilee celebration he’s been asked to devise, putting the camp at its centre in counterpoint to the populist nationalism which has infected Europe since 2008. Fenia spots what she thinks is a winner but in a masterly piece of out-maneuvering, finds herself on the back foot and the celebration plans in tatters. Meanwhile, Inspector Brunfaut is trying to track down the pig, now a media star, while puzzling over why he’s been told to drop a murder investigation and Matek Oswiecki tries to dodge the consequences of what may well have been a botched assassination. These many and varied characters crisscross each other’s paths over a long hot summer in which migrants are heading for Germany. A multitude of shifting character perspectives coupled with a good deal of information about EU institutions to absorb results in a slow start but patience pays off with The Capital. Swipes are taken at bloated bureaucracy, political manouevering and empire building but ultimately, it’s the founding values of the European Commission which are at the heart of this novel, that never again should Europe be faced with the horrors threatened by populist nationalism. Professor Erhart gives full voice to these ideals in a speech which horrifies his think tank audience, peopled with the self-important and self-interested, and would send Brexiteers running and screaming for the door. It’s a wide-ranging novel, at times wryly funny at others almost slapstick, but like all good satire it has some very serious points to make both about the EU and the forces that have taken hold in Europe since the financial crash. Rather like the institution its satirizing, The Capital is not without faults – some of its threads remained tangled for me – but there’s much to enjoy, bittersweet though it is in more ways than one. This entry was posted in Reviews and tagged EU in fiction, Jamie Bulloch, Maclehose Press, Robert Menasse, Satire, The Capital on 22 February 2019 by Susan Osborne. I’ve been a keen fan of Patrick deWitt’s fiction since reading his darkly comic ripping yarn, The Sisters Brothers. His last novel, Undermajordomo Minor, was entirely different having more than a touch of the Gothic fairy tale about it. French Exit takes yet another turn with its caustic caricature of the wealthy upper classes, taking its readers from New York City to Paris in the company of Frances Price, her son Malcolm and Small Frank, their ancient cat. Frances has been avoiding her financial advisor. She knows what’s coming. After years of jaw dropping extravagance her husband’s money has finally run out. She sells the contents of her swanky apartment, then the apartment itself, stashing 185,000 euros in cash along with her sedated cat in her handbag and crosses the Atlantic with Malcolm in tow. On board ship, Malcolm briefly takes up with a medium, later banged up in the brig for telling a passenger she’s about to die which said passenger promptly does. Once settled into her best friend’s apartment, Frances sets about ridding herself of her cash but not before Small Frank runs away. Soon they’ve acquired a full house of lodgers including a lonely widow, a private investigator and Madeleine the medium, tracked down to contact Small Frank. Frances is still spending money like water, handing it out to strangers when there’s nothing left to buy, and she’s desperate to find Small Frank. He is, after all, the vessel that houses her dead husband’s spirit. DeWitt’s satire is almost cartoon-like in its outlandish comedy, lampooning the rich with a cast of vividly memorable characters: Frances the sharp-tongued widow, long thought to have taken off to Vail on a skiing trip after discovering her husband’s corpse; Small Frank lumbered with Franklin’s truculent, whining voice as he roams Paris, flea-ridden and hungry; and Malcolm whose only purpose in life is to keep his mother company. There’s a degree of humanity amongst all this excoriation: Malcolm’s emotional constipation after a childhood of being ignored by both parents contrasts with his mother’s attempt to burn the house down to get attention when she was a child. Not my favourite deWitt novel – The Sisters Brothers still holds pride of place for that – but still a welcome treat. This entry was posted in Reviews and tagged Bloomsbury Books, Canadian Fiction, French Exit, Patrick Dewitt, Satire on 3 October 2018 by Susan Osborne. Samuel is an assistant professor in his mid-thirties, still yearning for his first love, one acclaimed short story under his belt, a long-spent advance for a novel on the strength of it and an unhealthy addiction to computer games. He’s faced with a perennial problem for academics – the plagiarised paper – but hasn’t bargained on the towering sense of entitlement and self-esteem of its ‘author’ who soon persuades the all too accommodating authorities that it’s Samuel who’s in the wrong. Meanwhile a woman in her sixties throws stones at the Governor of Illinois, quickly becoming notorious while ensuring the Governor a foot on the presidential nomination ladder. The Packer Attacker, as the media dubs her busily adding a few salacious details into the bargain, turns out to be Samuel’s mother, last seen by him in 1988. Now she needs a letter, a character reference, to help get her off the hook but Samuel’s publisher, always a man with an eye for the main chance, sees an opportunity to cash in, persuading Samuel to write book about his mother. Like all good academics, Samuel embarks on researching his subject but finds himself looking for an answer to the question that haunts him: why did she leave? Hill’s book is a big novel in every sense of the word. With a keen acuity, it explores the panorama of American life from the heady idealism of the ‘60s – or so it seemed – to 2011 with the world still reeling from the global financial crisis, through the lens of Faye and Samuel’s stories, shifting from one point of view to the other as it does so. It’s a completely engrossing piece of storytelling which takes you backwards and forwards from Faye’s early adulthood, brought up by a man who taught her to be afraid of failing, to her brief brush with radicalism at her Chicago university, to her 2011 infamy and Samuel’s reappearance in her life. The writing is striking from the get-go as Hill describes Faye’s long drawn out departure from the family home. He draws you in to each of his story’s time periods, gathering up your attention so that you’re loath to tear yourself away from one to the next then quickly absorbing it again. The 1968 sections are particularly sharp, the description of the riots surrounding the Democratic Convention gut-wrenching – urgent, bloody and terrifying. And it’s very funny: Hill hurls well-aimed barbs at all manner of things from social media to advertising, publishing to academia – the latter spot-on according to H – to mention but a few. Careful plotting – there’s a particularly pleasing reveal towards the end – ensures that each piece of the puzzle slots neatly and satisfyingly into place until both Faye and Samuel’s stories are told. It ends with fresh starts, a much-needed reminder that despite all that’s gone before there will always be both redemption and hope somewhere in the world, albeit personal rather than political. I read this novel in the long shadow of the Trump presidency but it was written while that prospect must have seemed a distant nightmare. As I read it I wondered if Hill’s story might have been any different had he known what was to come but I hope that ending would have remained the same. This entry was posted in Reviews and tagged American contemporary fiction, Nathan Hill, Picador Books, Politics in fiction, Satire, The Nix on 27 January 2017 by Susan Osborne. Way back in the mid-‘90s, Jonathan Coe published What a Carve Up!, a wickedly funny satire on Thatcherism in which the Winshaw family had their fingers in a multitude of nasty pies. I was in bookselling at the time and my Penguin rep and good friend, A, gave me a proof, praising it to the skies. Twenty years later and the Winshaws are back. Thanks to A who handed over a copy of Number 11 when we met for lunch last weekend I’ve been chortling over their return. Sadly, Coe has just as much to satirise now as he did all those years ago and much of it in the same vein. Ten-year-old Rachel and her friend Alison are visiting Rachel’s grandparents when the news of David Kelly’s death breaks. It’s the first death, perhaps the first bit of news, that Rachel registers and it has a profound effect on her. She and Alison make an uneasy alliance. It’s their mothers who are the real friends, both single parents hoping for a bit of fun during their break in the sun. When Alison finds what she thinks is a dead body together with a few playing cards – one marked distinctively with a spider – she drags a reluctant Rachel off to see it, only to find the corpse has disappeared. Suddenly a hand seizes a second playing card left abandoned, terrifying the girls. The hand belongs to the Mad Bird Woman who Rachel remembers flying a kestrel one half-term visit with her brother. Alison, by far the sassier of the two, persuades Rachel that they need to get to the bottom of the mystery. Taking their courage in their hands, they visit No 11, the house on Needless Alley where the Mad Bird Woman lives, and find that appearances are not always what they seem. Coe’s novel follows Rachel and Alison over the next decade during which many of the roads they travel will lead back to the nefarious shenanigans of the Winshaws, taking swipes at all manner of things from reality TV to factory farming along the way. ‘Sequels which are not really sequels. Sequels where the relationship to the original is obilque, slippery’ notes one of Coe’s characters in an essay on film. Maybe Coe’s warning us about thinking of Number 11 as a sequel to What a Carve Up! but the ghosts of the Winshaw family, who met such a satisfyingly sticky end, are everywhere. Perhaps it’s a political comment rather than a literary one. Whichever, Number 11 bears many familiar Coe trademarks: intricate plotting, comic misunderstanding and arcane film references reflecting his early career as a cinema critic. The final section is a winning combination of Ealing Comedy and B-movie horror. It’s a very funny novel but, as with all good satire, its subject is deadly serious: the ever more gaping divide between the haves and the have nots. People who look like you or me are forced to resort to food banks while Rachel’s employers dig down eleven floors for a basement for one of their six homes just because they can. 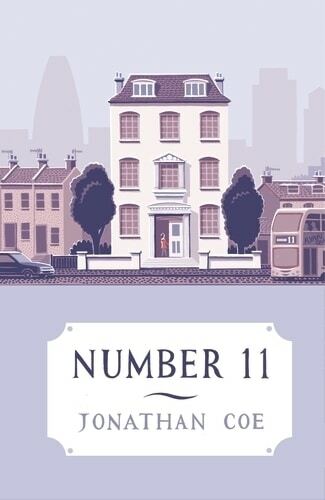 This is Coe’s eleventh novel – expect the number eleven to pop up again and again – but something tells me that the Number 11 he has in his sights is the chancellor’s. Maybe it’s that infamous George Osborne quote ‘We’re all in this together’ which precedes the final chapter, What a Whopper! Bit of a giveaway. This entry was posted in Reviews and tagged British Fiction, David Kelly, Jonanthan Coe, Number 11, Satire, Viking books, What a Carve Up! on 25 November 2015 by Susan Osborne. 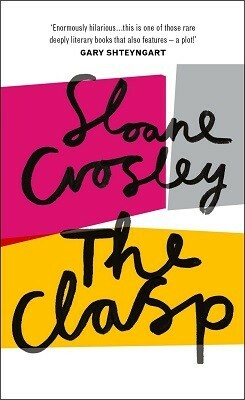 Sloane Crosley has published two collections of essays including one with the wonderfully peevish title I Was Told There’d be Cake, or at least it sounds peevish to me which may tell you something about how I feel about cake and broken promises. The Clasp is her first novel, a classic comedy of manners in which a group of old friends from college are reunited – some eager to catch up, some not so much – all finding that life is turning out not quite as they expected. It’s also a witty homage to ‘The Necklace’, Guy de Maupassant’s short story about a woman who, feeling cheated of the luxurious life she feels is her due, borrows a necklace but loses it spending the rest of her life paying for a replacement only to find the original was a fake. Victor finds himself sitting at a table the other side of the room from his college friends at Caroline’s wedding. He knows she dislikes him but ostracism seems a step too far. Across the room he can see his friends Kezia and Nathaniel happily chatting. Victor’s been nursing a decade-long crush on Kezia who in turn longs for Nathaniel. Nathaniel, it seems, lusts after anything in a pretty package but is currently obsessed with the extraordinarily beautiful but absent Bean. When Victor is sent off on a quest for a bottle of whiskey, he falls asleep in one of the bedrooms and is embarrassed to wake up alongside the groom’s mother who shows him a drawing of an ornate necklace and tells him its story. This is the catalyst that will change Victor’s life. Taking her readers from a Florida society wedding to Paris and Normandy by way of Hollywood and New York, Crosley weaves an enjoyable tale around these three who by the end of it may actually be ready to enter the adult world. A decade after leaving college Victor’s been sacked from his job as a data scientist, Kezia’s brave leap from the corporate jewellery world has backfired and Nathaniel’s apparent success is not at all what he allows his friends to think. Crosley has a fine line in sharp observations on that stage of life when realisation is beginning to dawn: ‘There’s something morbid about weddings. Like high school yearbook photos. Like we’re all being prepped for the slide show of our funerals’ says Victor morosely. Her portrayal of Americans ex-pats and their view of the French is particularly acerbic – ‘No wonder Grey was so unhappy. Parisians were glamorously tattered and superior down to their tile grout’ – not to mention the vapidity that pervades Hollywood and its obsession with ever wackier fads. You have to suspend your disbelief at times – it’s all somewhat improbable – but if you can do that it’s a thoroughly entertaining, smartly funny read. A tad too long, though, but that seems to be a frequent lament for me. This entry was posted in Reviews and tagged American fiction, Guy de Maupassant, Hutchinson, Satire, Sloane Crosley, The Clasp, The Necklace on 13 November 2015 by Susan Osborne. 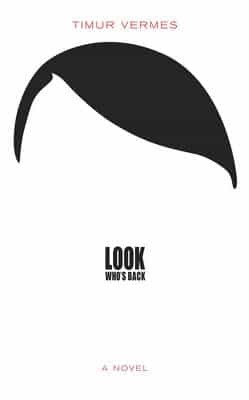 Look Who’s Back by Timur Vermes (transl. Jamie Bulloch): Who do you think you are kidding Mr Hitler? Adolf Hitler wakes up with a dreadful headache. He’s a little bemused to find himself lying in what seems to be a wasteland. He picks himself up and makes his way to a news kiosk where he’s astonished to find that it’s August 30th 2011. He’s at a loss to know what’s happened but the newspaper seller whose stand is frequented by media types spots an opportunity. This guy, who appears to be a method actor, is such a dead ringer for the Fürhrer all he needs are a few introductions to the right people. Before long Hitler’s spot supporting comedian Ali Gagmez on TV is so successful that he gets his own show. There are a few hitches with the contract – just what is his real name – but soon he’s the current YouTube phenomenon. The trouble is, nobody quite gets it: they think he’s particularly edgy stand up comic – he thinks he’s launching a campaign to restart National Socialism. Satire can often go horribly wrong, particularly if you choose to narrate your novel through the voice of one of the 20th century’s greatest villains, but Timur Vermes carries it off beautifully, chucking lampoons in all directions and managing to hit his mark nearly all the time. Celebrity culture, modern politics, the internet, TV, social media, tabloid newspapers, binge drinking – they all get a bashing. Hitler spends much of his time in a state of furious astonishment at the idiocy of the modern world and the parlous state of the German people, led by a woman for god’s sake. When he’s exposed to modern TV for the first time he’s amazed by its vacuous nature; he fears there must be a bread shortage when he’s given a granola bar and finally sees the point of those pesky ringtones when his secretary assigns him The Ride of the Valkyries. Like all good satire, there are sharp observations within the jollity – Hitler has trouble with his email address as so many people have already nabbed the appropriate ones, he’s gratified to find so few mixed race children despite the Turkish immigrant population, after the initial wonder of the ‘Internetwork’ he’s quick to spot a propaganda tool. At times he’s horribly plausible, and of course he loves animals and children. The novel ends on a warning note – maybe there are some people who think he wasn’t all bad. It’s hard to keep blistering satire up for well over three hundred pages even if it is punctuated by slapstick hilarity and, for me, the novel was a little too long. That said, no one could accuse Vermes of being anything but original. Hats off to translator Jamie Bulloch, not just for an excellent translation but for adding a short essay on the German historical and political context for the novel. Not surprisingly, Look Who’s Back caused a bit of a stir in Germany when it was published. It stormed up the bestseller charts and stayed there for 70 weeks, apparently. It’s a brave author who tackles a taboo subject in the way Vermes has – I’m British but I felt a little squirmy at times. What do you think? Are there any subjects you’d consider completely verboten? This entry was posted in Reviews and tagged Adolf Hitler, Books, German fiction, Jamie Bulloch, Maclehose Press, Satire, Timur Vermes on 4 April 2014 by Susan Osborne.